eat, drink & be vegan: Who gets to do the (vegan) happy dance? Who gets to do the (vegan) happy dance? Winner is animal-friendly! Congrats, girl! Please e-mail me so I can get the books sent to your door! Also, I am going to post up several recipes to keep you guys happy as well. You'll see I've just posted the Cashew Banana Ice Cream. Check in for more, and I'll update my blog to let you know what recipes I've posted. 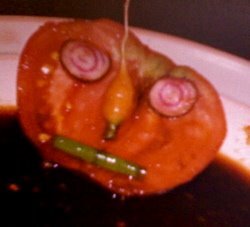 First, I appreciate all of your interest in the contest and in eating vegan. There were some comments that really touched me, and I want to encourage all of you to keep on the vegan path. I will help you if I can, so please contact me here or through my e-mail if I can help you. Second, on that note of e-mail... I have lost an e-mail that one of you sent me. :( I'm very sorry, my e-mail was acting wonky and rerouted the e-mail into trash. I wasn't able to reply straight away on your message, as I was catching up, though I know you had several questions you wanted me to answer. When I was ready to reply, I realized your message had been routed to trash and deleted. So, if you e-mailed me and have been waiting for a reply, would you please resend your message to me. I've been meaning to try this ice cream recipe - it looks delicious! And it would be much faster than throwing batter into my ice cream machine and having to wait 30 whole minutes. Yes for instant cashew banana gratification! And thanks so much for all you do - your recipes make the world of vegan eating so much yummier! Ditto Ruby Red, I've been meaning to make this ice cream and think I'll do that for our Memorial Day dinner. It's 100 degrees here and it will be perfect. I'm sure we can eat it before it melts! I'm excited about Oprah going vegan too. She has a tremendous audience. I heard some DJs talking about it and one was all "it's not a meal without meat" and the other was more "if Oprah can do it, I can totally do it." Hey Dreena! I emailed you my address, and I'm just wondering if you got the email? Thanks so much, and thanks for the contest! 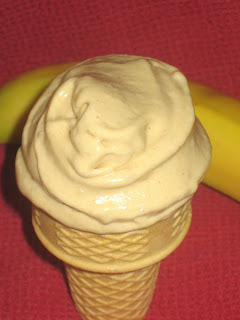 By the way, this cashew banana ice cream sounds perfect for summer- it looks great! Wow, this recipe sounds great and healthy! Dreena, all of your recipes are fabulous, and this one is no exception! My husband and I just tried it today. Wow. It is so creamy and delicious. Thank you for the gift of ice cream this summer! It's scorching hot here! Well, it's something like 26 or 27 but it feels scorching after a long winter. Ice cream is certainly needed today. oh, i want to make some of this ice cream, but right now we are macking on chocolate mint melties!!! you keep my sweet tooth happy. Did anyone see that Ellen is going vegan too? She didn't say that word for word but she had the women who wrote Skinny Bi*ch on her show the other day and told them the book completely changed her life and the way she eats (she said she lost a few pounds too!). Yay! Ruby red, 30 mins is waaaaay long for me to wait for ice cream too! Vicki, I'm always happy to satiate that sweet tooth! Brianne, yeah it hasn't gotten as much buzz as the Oprah 21-day cleanse, and I don't think any of us know how close to vegan Ellen is eating... but again, having the authors of that book on her show is a good thing - even better if it means that she is in fact eating vegan and might do more with it on her show down the road. Oh yum! That looks so amazing. I will definitely be making that in the coming months! Just wanted to come back and say we DID make this for Memorial Day and it was fantastic!!! We were stuffed full of burgers yet couldn't stop eating it. Yummmm! What an awesome way for you to spread the positive vibes of the Oprah vegan experiment, Dreena! If only every new vegan would be given your books- they'd never look back! atxvegn, that's sa-weet! :) Happy to hear you all loved it so much. thx! aw, Bazu, you're a peach, many thanks.